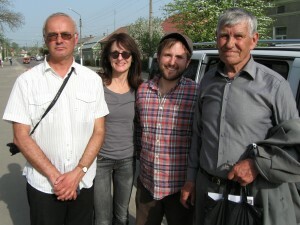 Jay and I are at the Lviv airport flying home today to Paris, and while here I want to give a report of our day in Rohatyn yesterday with Alex Denysenko and Jeremy Borovitz, along with France 2 TV reporter Renaud Lavergne and his cameraman Vincent Barral. As usual, Alex arranged for Vitaly to be our driver in his large van. Renaud and Vincent filming in Rohatyn. Photo © 2013 Jay Osborn. visiting the mass grave sites at the south end of town. I will tell you highlights and issues of the foregoing. Newly-found headstones by the river. Photo © 2013 Alex Denysenko. 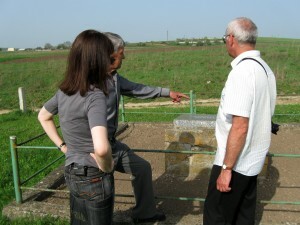 First, the day before our arrival, Mr. Vorobets learned of 3 headstones that were “uncovered” by recent heavy rains. These were still beside the road in an area not far from the river (and near Daria’s house) where in the past we have recovered several other headstones. This was a road that was known to have been paved by the Nazis with headstones from the Rohatyn Jewish cemetery, so continually “suspect”. Moving headstones to the van. Photo © 2013 Alex Denysenko. Jay, Alex, Jeremy, and Vitaly were able to lift these 3 headstone pieces into the van, and later in the day they were returned to the cemetery where they were photographed. The entire process was filmed and, to the extent that this segment does not end up on the cutting room floor of France 2, may appear in the final version which will air this summer in France. 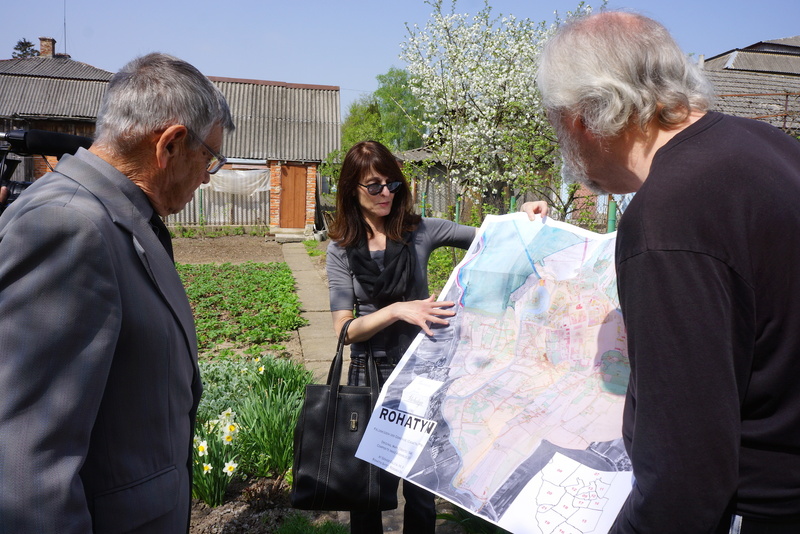 (Keep in mind that the program in total will be only 26 minutes long and will include at least half a dozen other Ukrainian and Polish towns; thus, the Rohatyn portion will be quite brief, if included at all). Mr. Vorobets with the 1846 Rohatyn map. Photo © 2013 Alex Denysenko. Second, Mr. Vorobets was very, very pleased to receive the map from the RSRG – special thank you to Jay and Alex Feller for making this happen and thinking of this as an appropriate gift. Third, Mr. Vorobets made prior arrangements for me/us to gain admittance into the former David Horn residence a few doors down from the former Polish Roman Catholic Church on one corner of the rynek, on ul. Halytska. This is the same house where, after the death of my family, Alex Feller’s great aunt Rosetta also hid. We had the unexpected pleasure of an invite by a woman living in the corner building (immediately adjacent to the Church) to come inside – this building was the former residence of David’s brother Jonas Horn and his family, who not only had a restaurant and saloon on the ground floor (living upstairs), but which also housed on other floors several other Jewish families, including that of Rosette’s future husband, Willy Halpern. 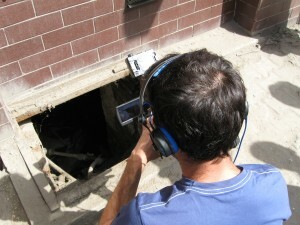 Peering into the cellar. Photo © 2013 Jay Osborn. 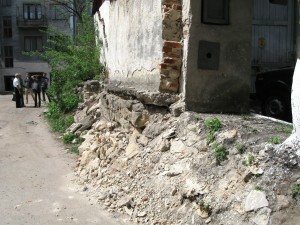 I had really hoped to gain access to the cellar where David’s wife Bronia Hornstein Horn and two daughters hid – from which they were ultimately denounced and marched to the rynek where they were then shot – but it turned out that the cellar was owned by someone else, and it was only later in the day that we were able to obtain a key and peer into the dark opening. It was not possible to descend into the cellar, however, although a few poor quality photos were made with flash by Jay, and cameraman Vincent was able to briefly lower the camera enough to shoot some film. Visible decay of the south memorial. Photo © 2013 Jay Osborn. Fourth, while at the mass grave site at the south end of town, Mr. Vorobets pointed out the deterioration of the Soviet-erected memorial, on the backside. We agreed that he could contact a local, reputable concrete repairman using funds he continues to hold from our group. We also gave permission for him to do similar repair work to the concrete base of the memorial at the “old” Jewish cemetery, which is also cracking at the base. The wall of stones. Photo © 2013 Jay Osborn. Fifth, as Alex warned us, most of the wall of Jewish headstones located in the former Gestapo headquarters courtyard has now been dismantled. I/we do not know what happened to the small fragments have been removed from there; we did not see them at the cemetery, and no one seemed to know who did the dismantling. In the nearby private garden – where last year several large, intact headstones were removed and returned to the cemetery by Mr. Vorobets, additional headstones have been located. The owner has again agreed to remove these, but only after the conclusion of the growing season (next fall), and our agreement to replace the space created by their removal with soil. 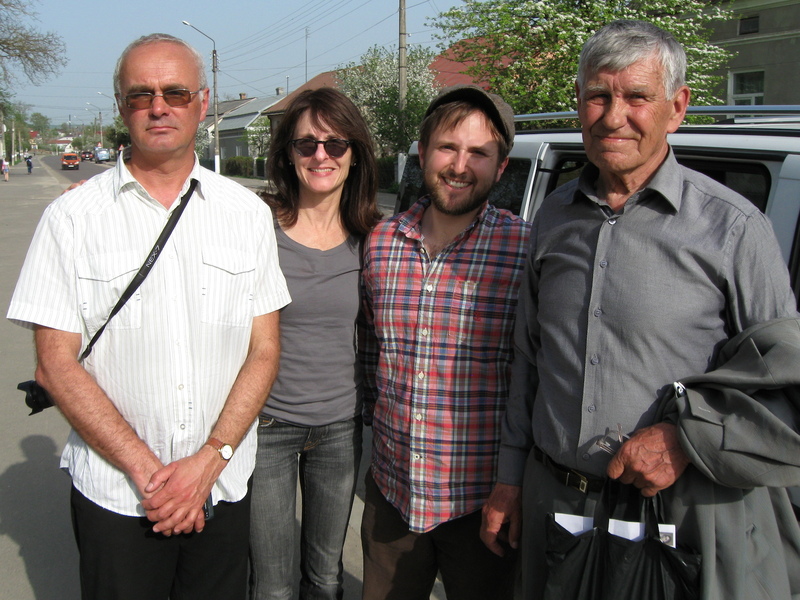 We authorized Mr. Vorobets to spend up to 200 hryvnia (about $25) from his RSRG fund to do ensure this happens. Finally, I have some very upsetting – but not altogether unexpected – news. Mr. Vorobets, who will be 80 years old this year, wishes to retire by the end of 2013. He does not feel his age, health, and family commitments permit him to continue to maintain the mass graves, the upkeep of the two Jewish cemeteries, and more importantly, his role as liaison between the local community and our group with regard to recovery of future headstones. He was genuinely pained to give us this news, and it was with great regret that he asked that we search for a suitable replacement. Alex, Marla, Jeremy, and Mr. Vorobets in Rohatyn. Photo © 2013 Jay Osborn. Of course, we are devastated and without ideas. Jeremy said he will be back in Rohatyn in May and will meet again with Mr. Vorobets to continue this discussion with him, in the hope that perhaps that Mr. Vorobets will have some ideas of a possible replacement candidate. I worry that this is very bad news for our group and our projects. Mr. Vorobets has been the key local figure “on the ground” for us. Without him, and without someone who is as respected, honest, and known in the community, I fear our work to date may die. Jay and I of course no longer live in nearby Lviv, and while Alex does, I strongly believe we continue to need someone living in the town of Rohatyn who is willing to assume the position Mr. Vorobets has historically played. I welcome and encourage the input of you all on this topic, as I am sure Jeremy does as well, preferably sooner rather than later. Mr. Vorobets’s designated replacement is now our highest priority as all else cannot realistically go forward without a local contact. Which beings to my last comment, and one that I have raised before: what are our long-term goals for the headstones? How do we proceed? Some of the headstones that have been brought to the cemetery in the last 2 years are already deteriorating due to exposure to the weather and elements. 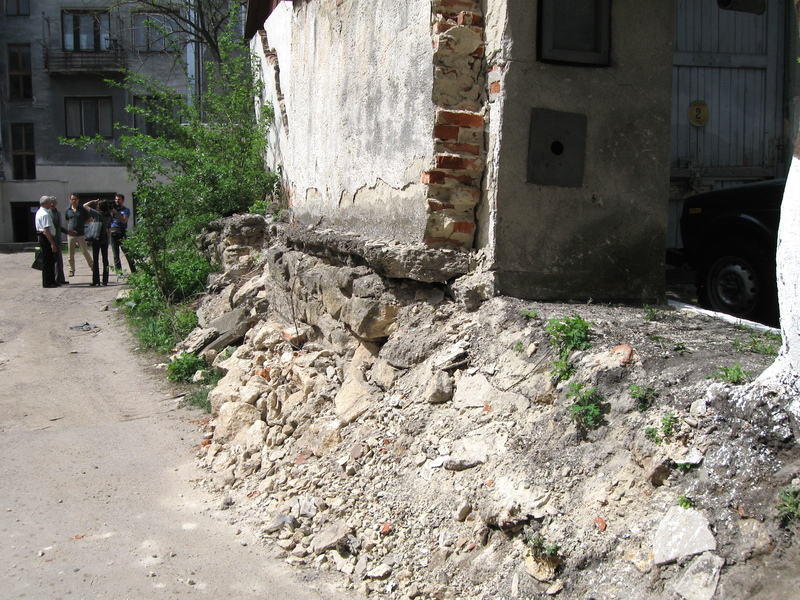 And the what to do with the human remains discovered in the tunnel below the Ukrainian Church remain unburied – a week ago while in Krakow at the conference on Jewish heritage preservation, I spoke with Meylakh of the Lviv Jewish community who had been in Rohatyn a few days prior. He reported that the Church is agitating to see a proper burial for these bones – and looking to us to advise on how to proceed. A Jewish burial or non-Jewish burial, and where? Without a response soon (and one year has passed since this issue was brought to our attention), the Church will unilaterally make a decision. Much to think about and discuss. Once back in Paris, I will write about last week’s Krakow conference.